When I first came across this novel, I was immediately pulled in by the cover. I loved it. The description also intrigued me. Stephen Alexander decides to stop for a vanilla shake after seeing a friend. When he sees a man carrying a little girl he doesn’t really think anything of it. But then he hears the words that will change his life forever…. Stephen intervenes and his actions spiral into something bigger than he ever could have imagined. Was it a case of just being in the right place at the right time? Or is this something bigger for Stephen? This was a bit of a coming of age story (even though the main character is an adult). Stephen has lived his life a certain way and now that he’s been thrust into the spotlight, he’s not sure if he wants his life to continue on the way it has. We learn a lot about Stephen. He’s a hard character to like at first. However, he grew on me and I was hoping for the best for him. The story was told from a few different perspectives and was a little confusing at times. I also had a bit of a hard time keeping some of the characters names straight. That being said the story is a good one. It kept me gripped and I really wanted to see how things were going to turn out for Stephen. Overall, I enjoyed this novel and I loved the story behind the cover and the title. 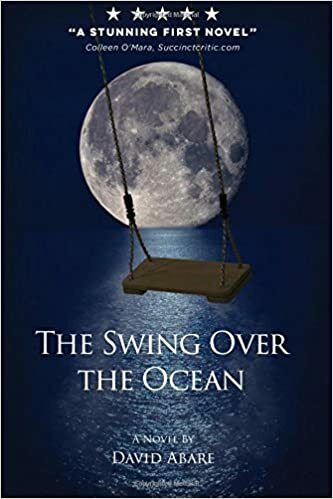 I’d like to thank the author, David Abare for sending me a copy of “The Swing Over the Ocean”. All opinions are my own. This sounds amazing. A situation every person worries about, “What would I do?” Nice review. It was an interesting read! Thanks for reading and commenting!